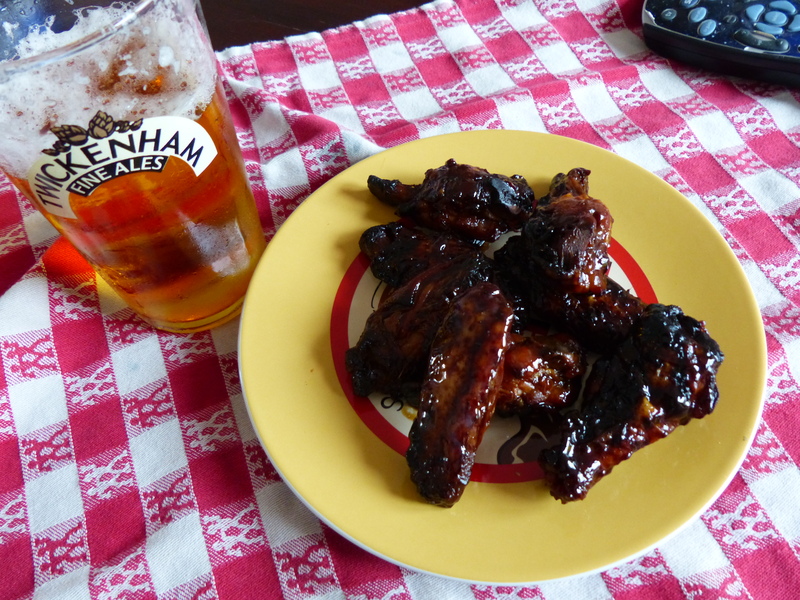 I would be remiss if this week’s entry didn’t involve Super Bowl-appropriate nibbles for the big game this Sunday. So here it is, America’s favorite bar food: chicken wings. Though I’ve partaken of my fair share of wings, I’d never attempted fixing them myself. 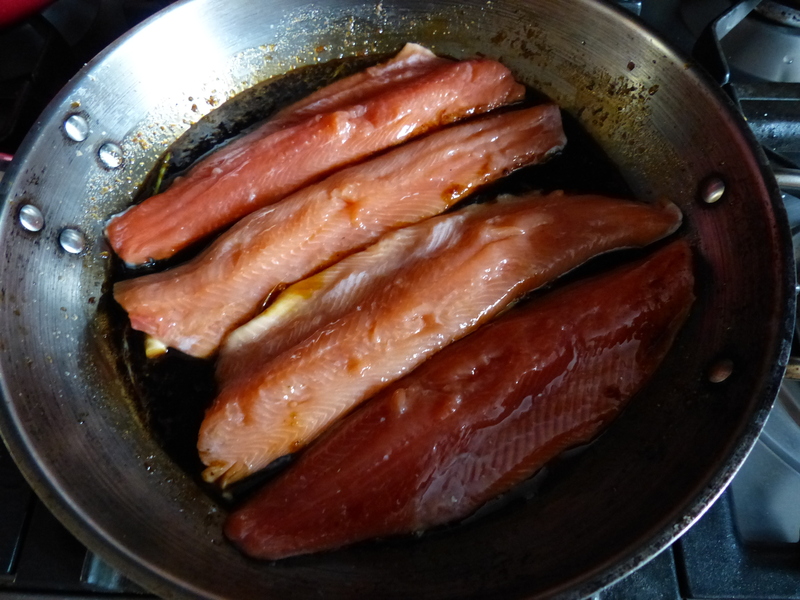 I looked through recipe after recipe with endless variations – baked, fried, slow cooker, buffalo, Korean, etc. – but all had a common denominator, of which I was completely unaware. Wings are comprised of three parts: tip, wingette and drumette. When you eat them at Buffalo Wild Wings you’re eating the wingettes and drumettes. 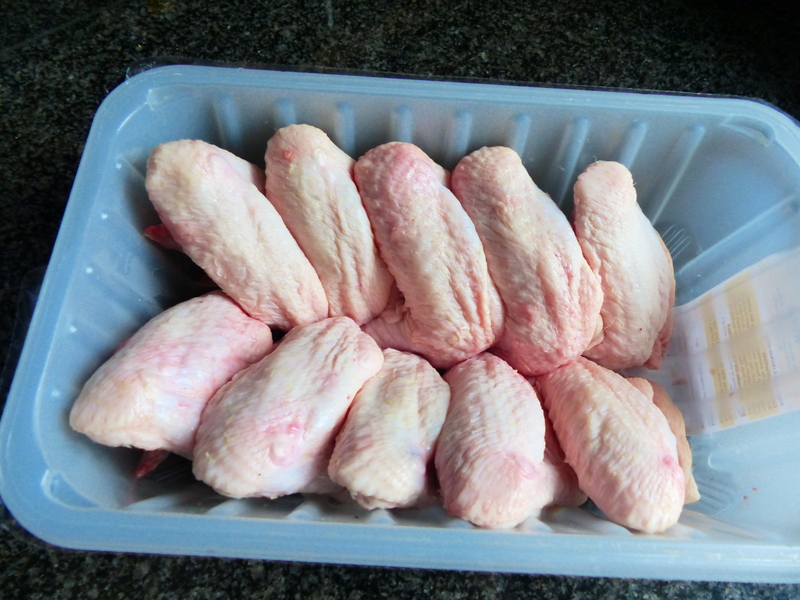 However most supermarkets sell the wing whole requiring a carving job by the home cook. I’ll admit I was a bit put off. Hacking up a chicken wing seemed like a bit of an ordeal. YouTube to the rescue! 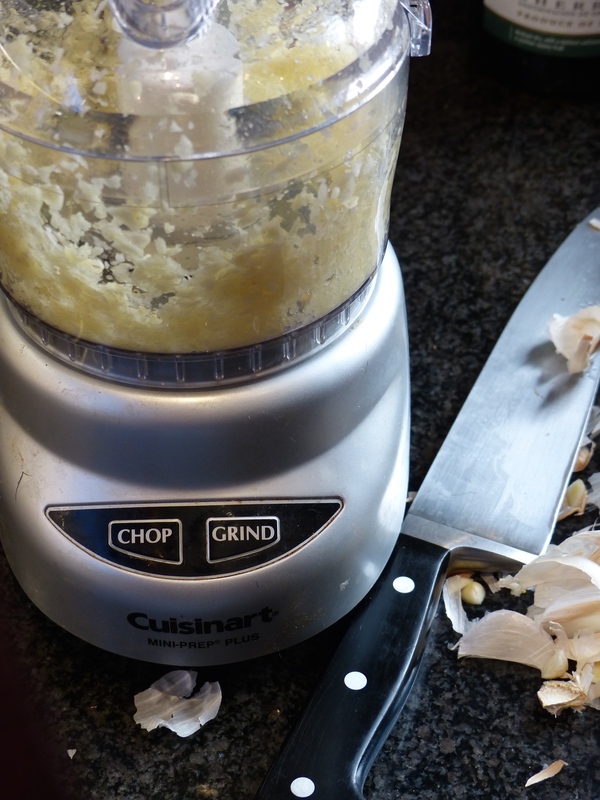 Thanks to YouTube I was able to watch several videos, some of which made cutting up a chicken wing appear ridiculously easy – akin to a knife through butter. It isn’t quite that easy, but it’s not exactly difficult either. Watch a few videos and I assure you, you’ll figure it out too. 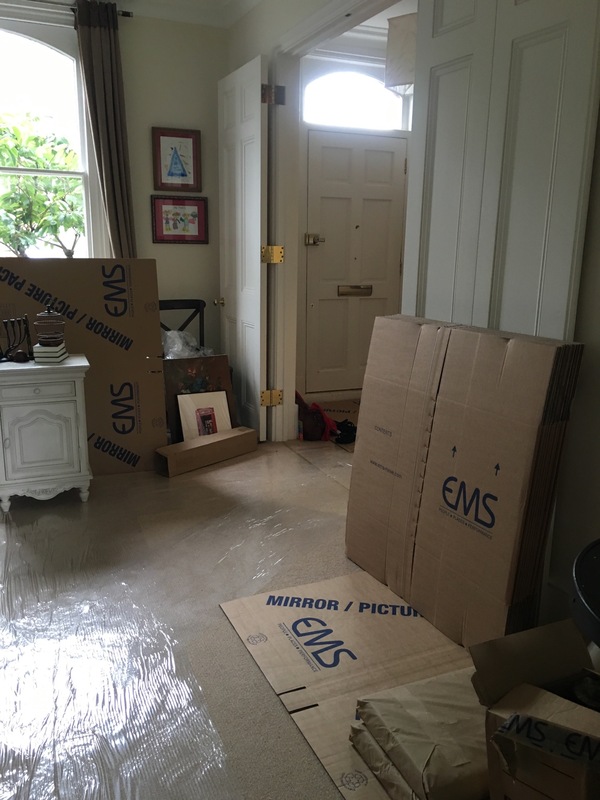 The whole watching and cutting process took maybe 10 minutes max. Now for flavorings, I knew I didn’t want buffalo wings as they’re too spicy for the entire family, so I was thinking more Asian style. 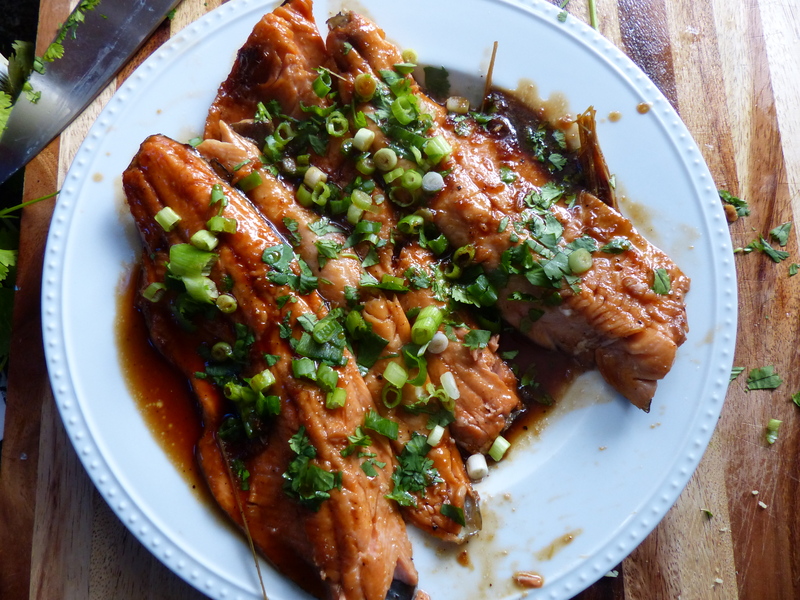 This was the first recipe I tried and it couldn’t have been simpler with amazing results. I am not waiting another 40+ years before making my next batch of wings. In fact, I’ll be fixing them up for Sunday’s Super Bowl – it’ll be a good midnight snack while we’re watching the big game here in London. Note: This was my first attempt at making chicken wings at home which means it was also my first attempt at cutting a whole chicken wing into sections (tip, wingette and drumette). 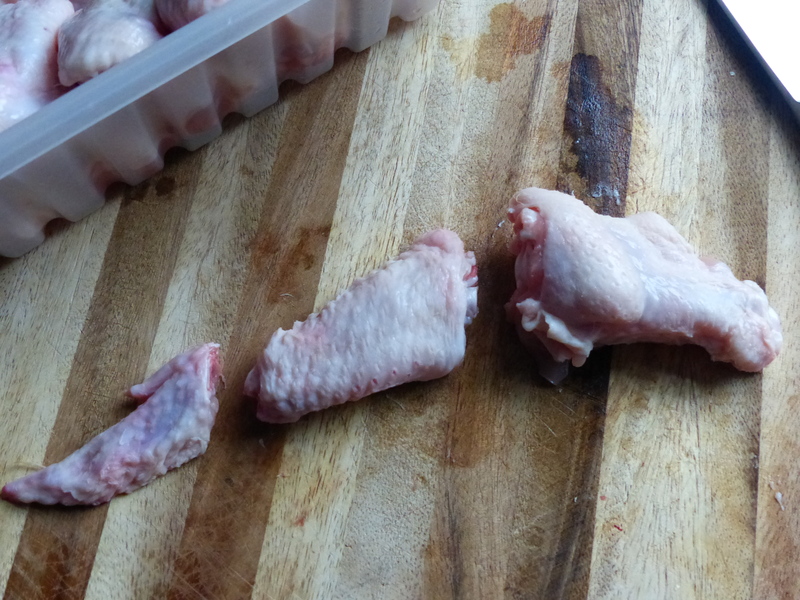 If you have never sectioned a chicken wing, I suggest watching a tutorial on YouTube. 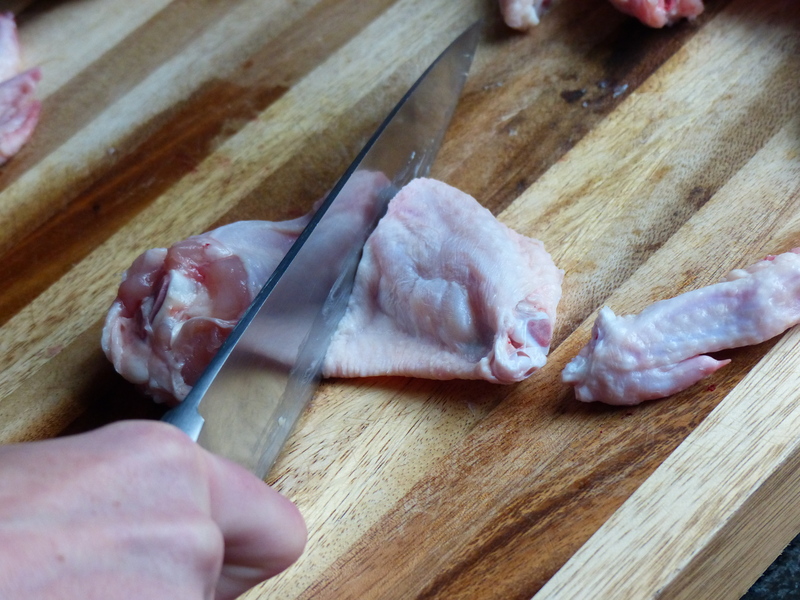 Search “cut chicken wings” and you should find quite a few. Preheat oven to 400°F / 200°C. Cut off wing tips and halve the wings at the joint, so that you have a wingette and drumette. 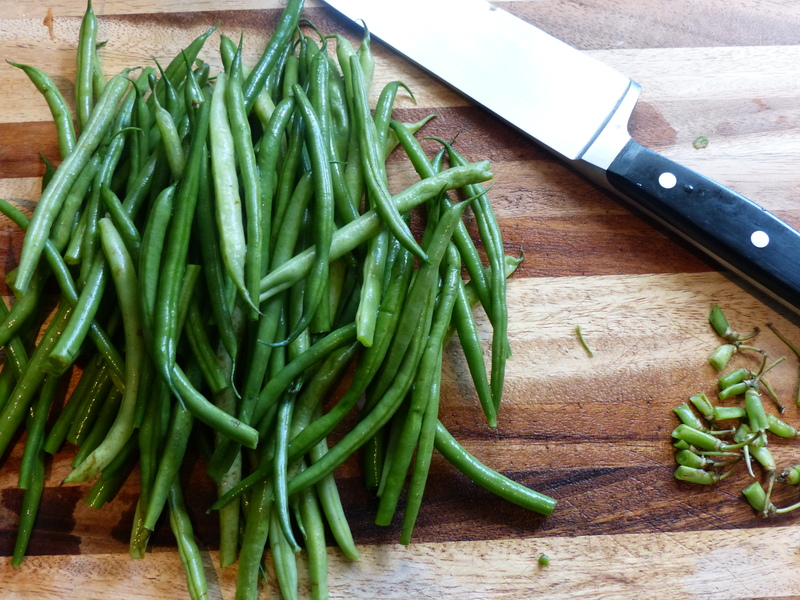 Discard the tips or save them to make chicken stock (which you can use in Homemade Chicken Noodle Soup). Arrange the wingettes and drumettes (you should have 48 pieces total) in a large roasting pan or rimmed baking tray in a single layer. If all the pieces don’t fit, put excess in another pan/tray. 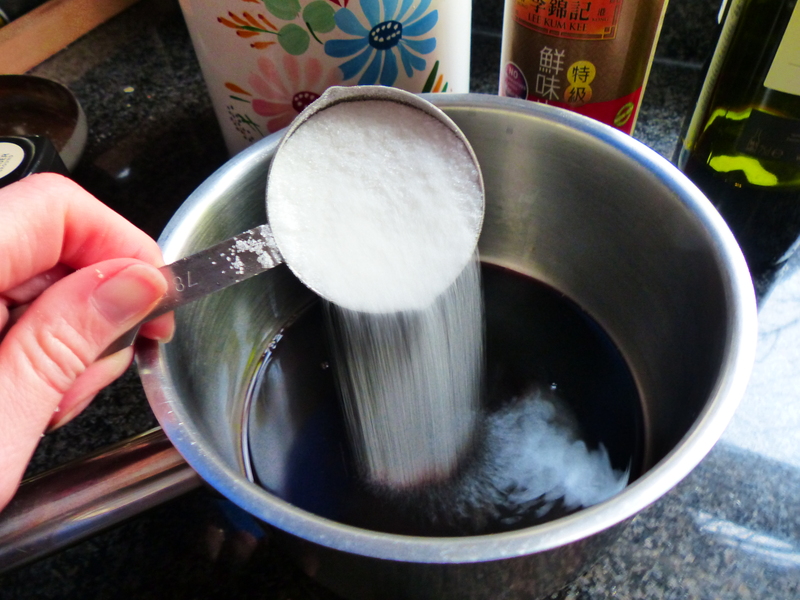 In a small saucepan heat the remaining ingredients over medium-low heat, stirring, until sugar dissolves (about 5 minutes). 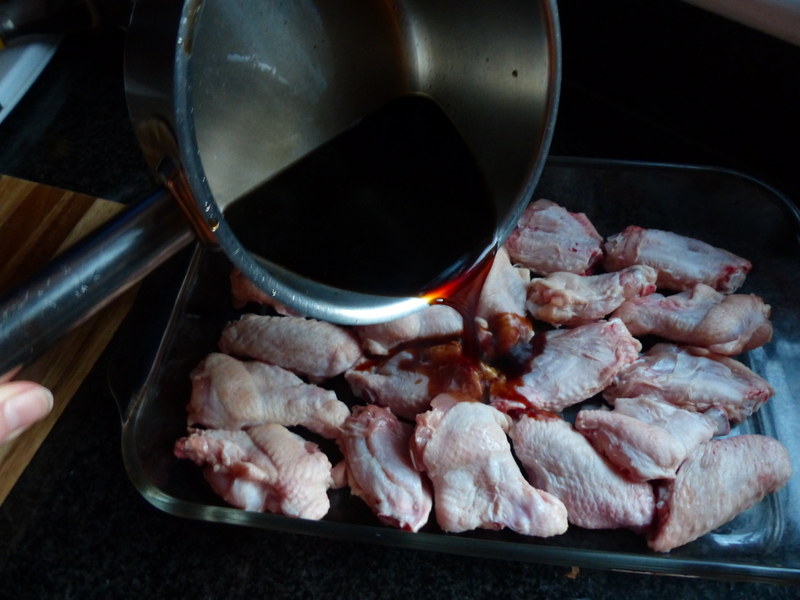 Pour liquid evenly over the wings and then using tongs or your fingers, gently roll the wings in the sauce so they are coated on all sides. Bake for 45 minutes. 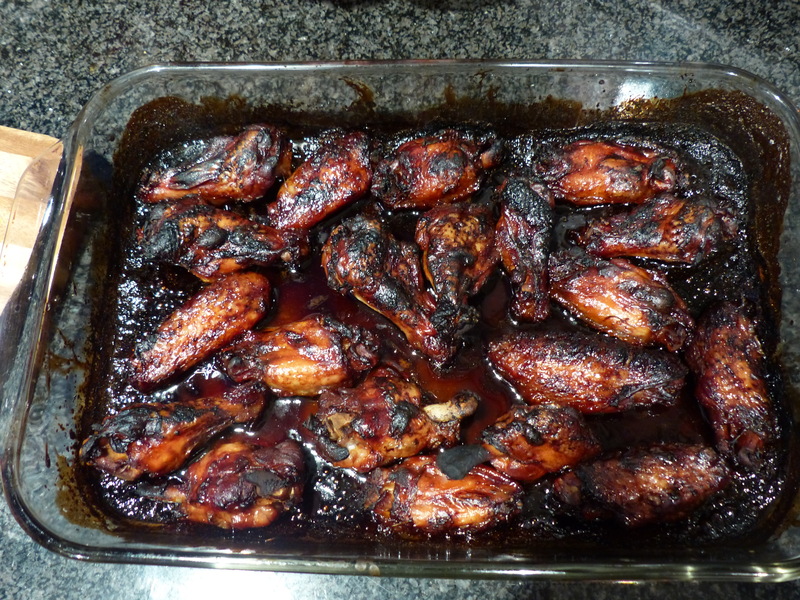 Turn wings and continue baking until the liquid becomes thick and sticky and wings become dark brown (a few burnt bits are ok), another 45 minutes to 1 hour. 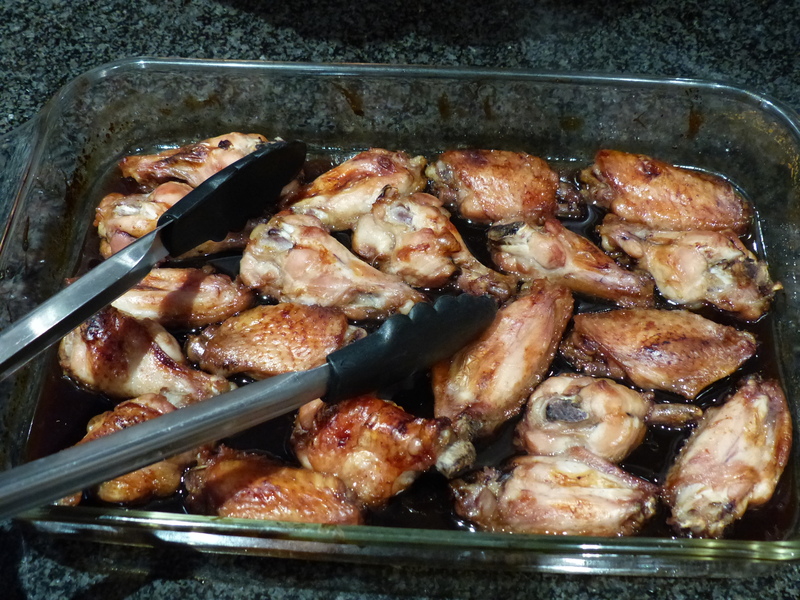 Let wings cool for about 5 minutes, transfer to a platter and serve….with lots of napkins. That’s the subject of an email I received back in November 2008 from my dear friend Maureen. Maureen and I go way back. Prior to this the only recipe I’d probably ever received and/or discussed with her was for mojitos that she learned to make in Cuba. But back in 2008 Maureen was settling into domestic bliss with her fiancé Rob and dabbling in the cooking arena. She always appreciated good food – organic, local – and especially loved her breakfast. Sadly Maureen was taken from us last week way too soon after a long struggle with breast cancer. “Mama Sunflower” had a light and a spark that most of us only dream of having. Everyone remembered Maureen! So many were touched by her and are struggling to understand her loss and grieving in their own ways. So I’m going to honor Maureen in the way I know best: with food. This was the first (and only) recipe that Maureen sent me, in that email titled “I love that I’m the girl that shares recipes now!”. I made it today and felt closer to her. 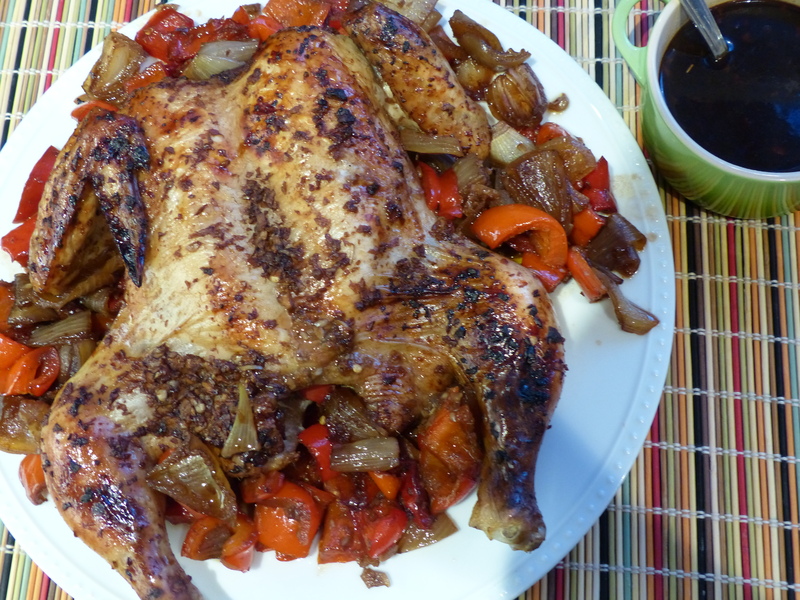 It’s a simple chicken dish, slowly cooked with a sweet-spicy sauce – much like Maureen’s vibrant personality. Her heart was filled with so much love, usually so patient and tolerant, but she also had a side-dish of sass. Make this comforting dish and be that girl (or boy) that shares their recipes and food with their loved ones. Because I do believe that food is a way of showing love. And as Maureen and her family always remind us, love is the answer!! Note: I prefer to buy my chickens from our local butcher as they taste so much better than the mass-produced chickens from the supermarket. As an added bonus, your butcher will probably butterfly the chicken for you (as mine does!). If you are butterflying the chicken yourself, check out this tutorial. There are also lots of videos on Youtube. 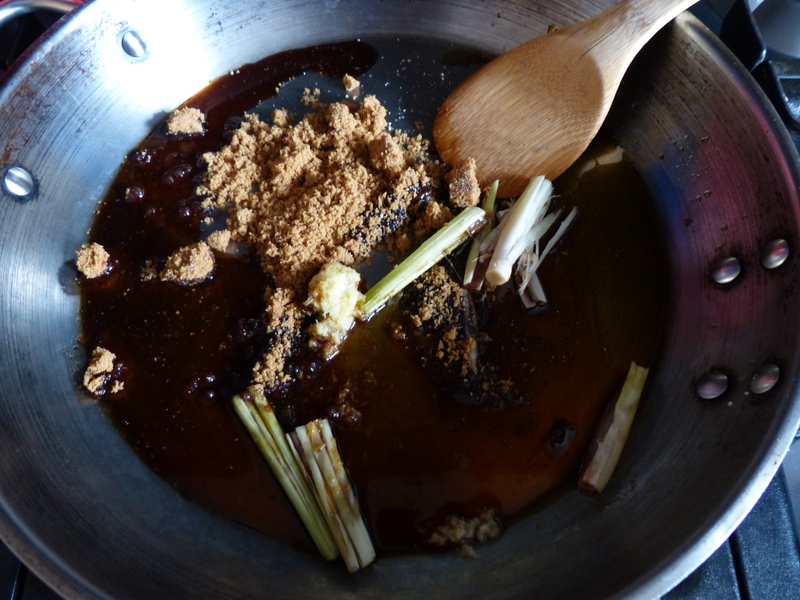 Basically you just remove the spine and flatten it, so that as much of the chicken as possible is in the braising sauce. 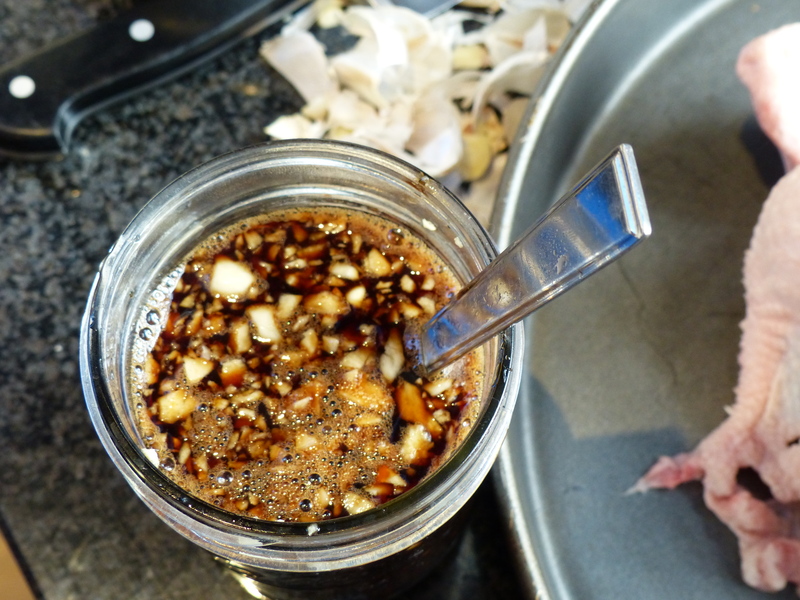 Another sidenote: I”m seriously dreaming of pouring the sweet-soy sauce over some chicken wings and baking them for seriously delicious sticky wings!! Let me know if you try that. Preheat the oven to 400º F (200º C). Spread chicken as flat as possible in a shallow pan. I use a deep-dish pizza pan but a large sheet pan would work well too. 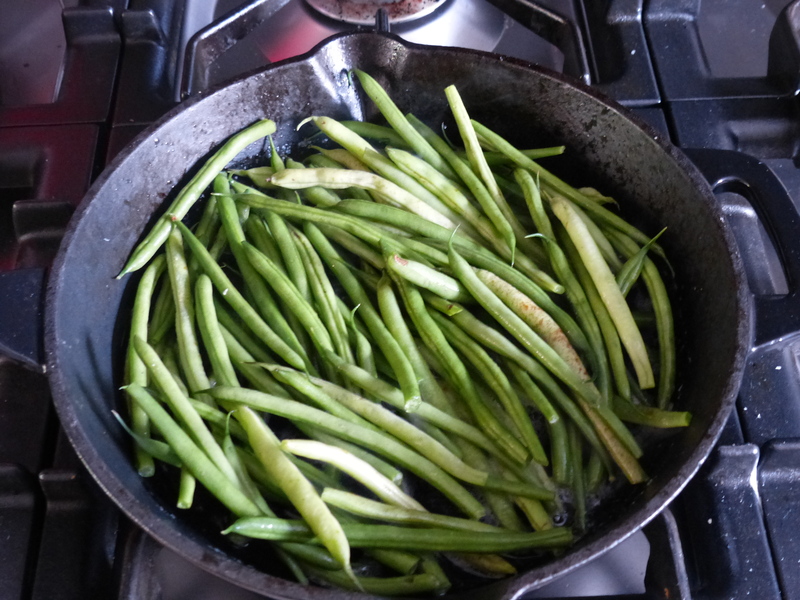 A 9″ x 13” (23cm x 33cm) baking pan is an option, but a shallower pan works better. 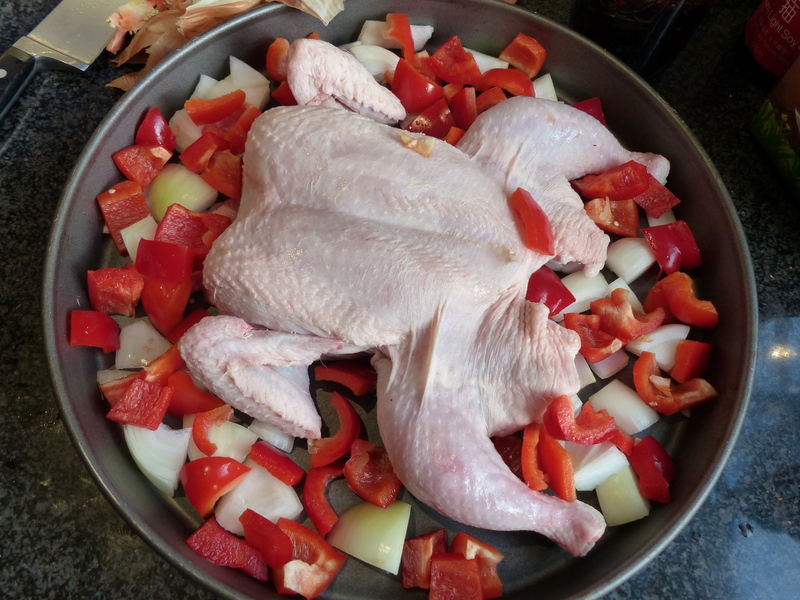 Scatter onions and red peppers around the chicken. 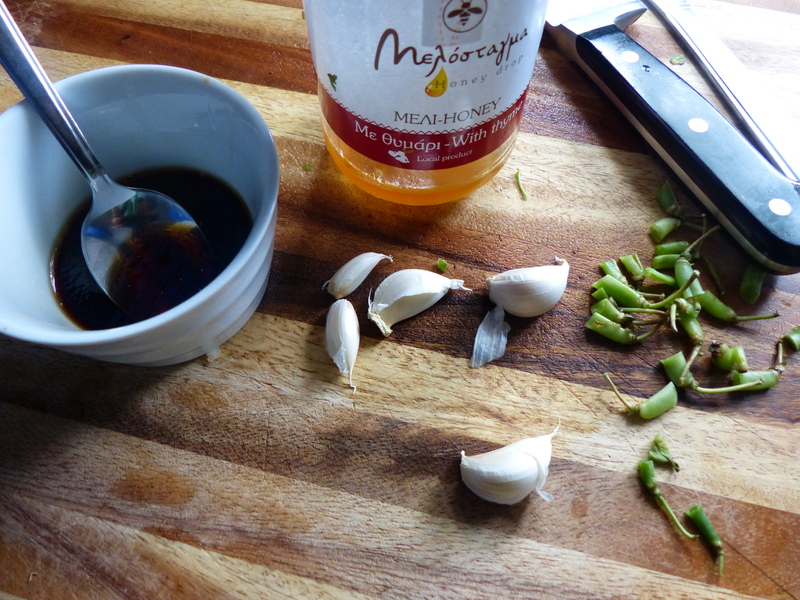 In a medium bowl, stir together the sauce ingredients (soy sauce through siracha). Pour sauce over the chicken and vegetables, tossing vegetables to coat. Place in the oven and roast for 10 minutes. 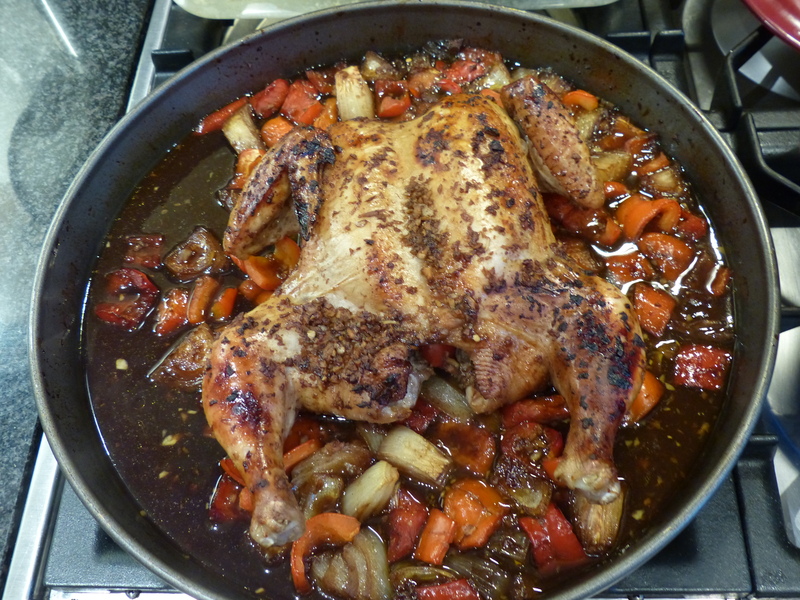 Reduce oven to 325º F (160º C) and roast for about another hour, basting chicken with sauce every 10-15 minutes. You can tell that the chicken is fully cooked when either (1) a thermometer inserted into the middle of a breast registers 165º F (75º C) or (2)the juices run clear when you cut between a leg and thigh. Remove pan from the oven. 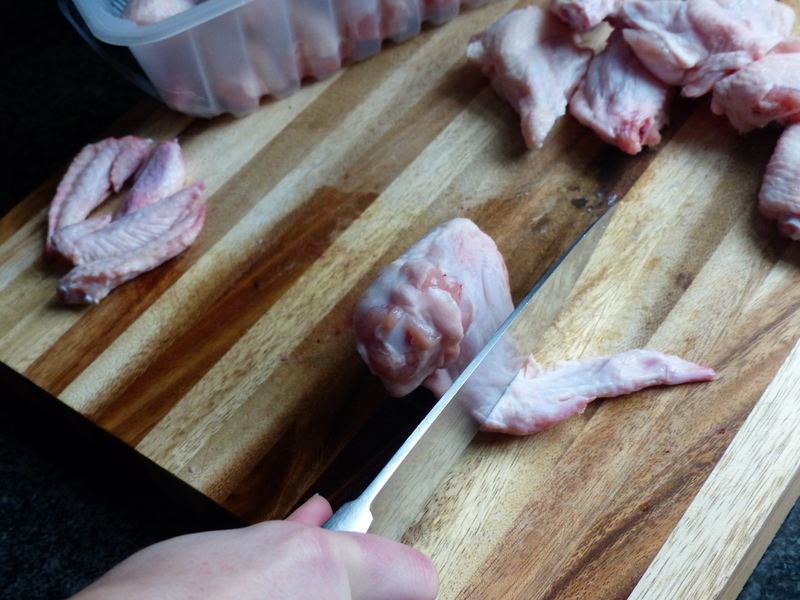 Using a spatula, carefully transfer chicken to a serving platter (you can carve it into individual pieces or present it whole). 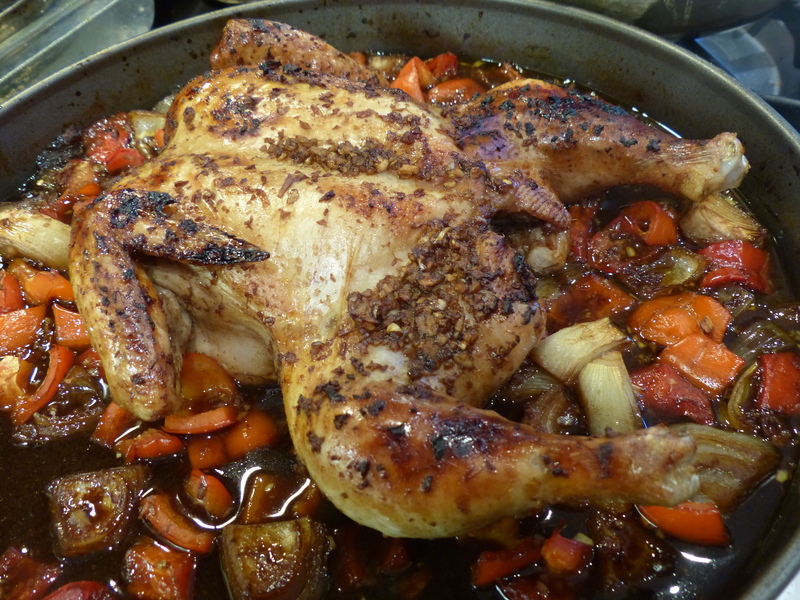 Using a slotted spoon, place vegetables around chicken. 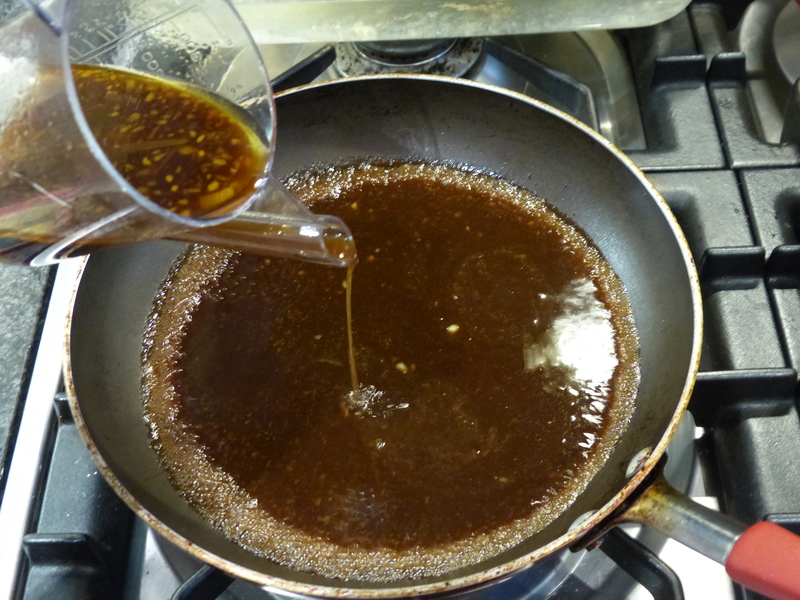 Skim as much fat as you can off the top of the sauce or use a fat separator (as I do in the pics above). 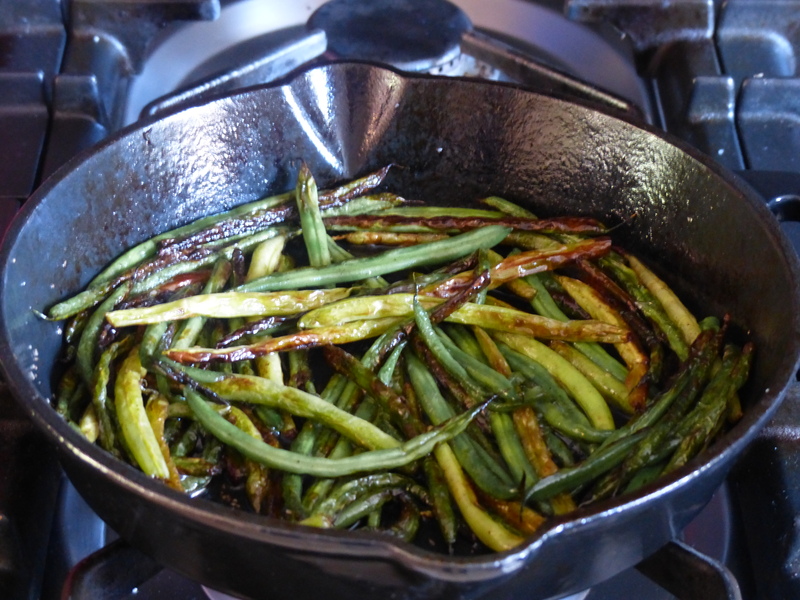 Pour sauce from roasting pan into a 12″ skillet over medium heat and cook until reduced slightly, about 5-7 minutes. 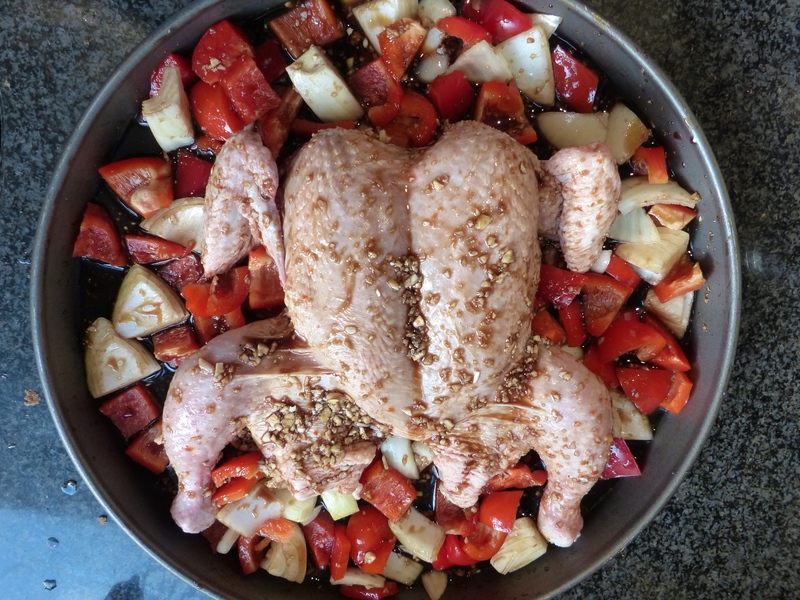 Serve chicken with rice, grain (bulgur is our favorite) or a small pasta (couscous is nice). Spoon sauce over chicken, vegetables and rice.